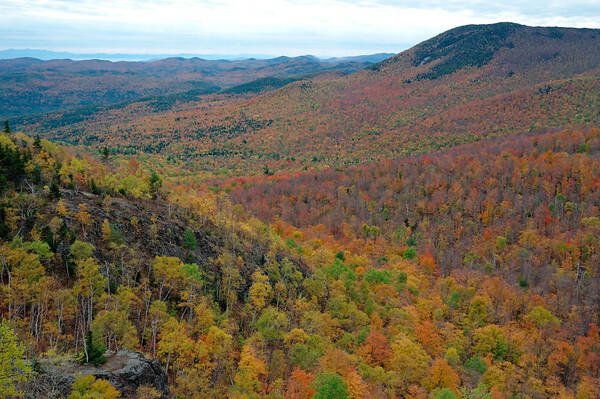 Usually, I found that staying at the Wilmington Notch campground near Lake Placid is an ideal base camp. 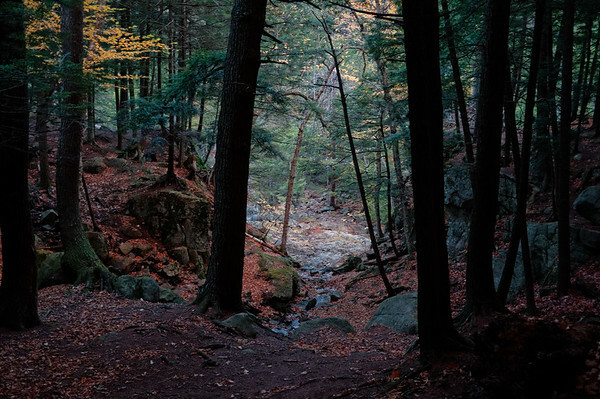 It’s conveniently located amidst many of the trails in the High Peaks and towns. 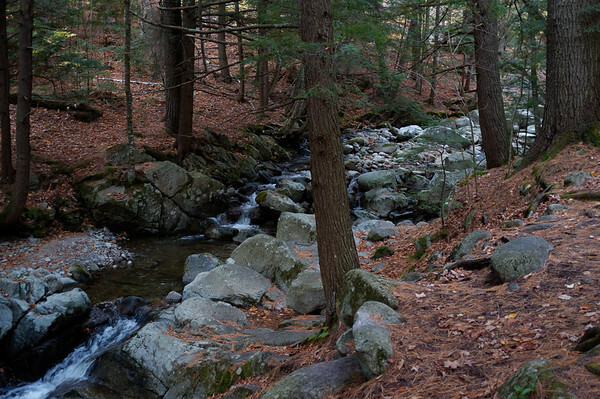 I also enjoy making a visit to the waterfall just a very brief trail away from the campsite itself. After arriving in the evening, I woke up the next day and immediately left camp in search of the Owl Head lookout trailhead. Not exactly the easiest to find but I eventually arrived at a full parking lot. I was pretty surprised at how many people were already on the trail this morning. I had initially taken a wrong turn (wasn’t paying attention to the trailer markers) and ended up passing by a key trail maker so I ended up getting lost. After wandering around in circles I finally made my way back to the parking lot and realized my mistake. Partially frustrated from wasting time, I was relieved to finally make my way towards the lookout. Along the way, I eventually found myself hiking next to a stream and encountered a large group of people working on building a new bridge. I was greeted by a cheerful park ranger and other folks with many humourous remarks and suggestions on how to cross the stream with the bridge under construction. 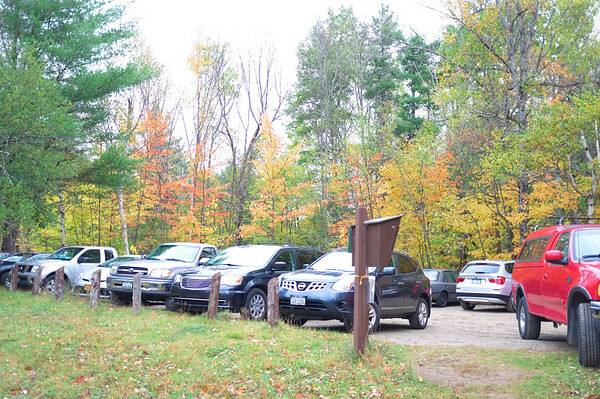 This explains why the trail’s parking lot was so full. I was told that by the time I return, the bridge would be complete (that wasn’t the case, although it was near completion). The trail up to the lookout point was beautiful and full of vivid colours but it was simply not comparable to the field of colours that was viewable from the lookout itself. It was only then that I realized how different it was to be on the ground level and be looking at the colourful leaves from the base of a tree. Having the opportunity to see the vastness of the mountains covered with colour is a dramatic change from what I usually get to see in Ontario. 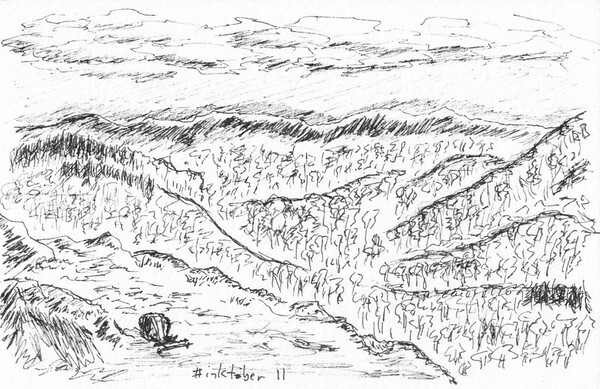 Aside from a couple of people, It was very quiet so I took the time to sketch the lookout point as a part of #inktober. Unfortunately I’ve yet to figure out how to manage technique in the cold and windy climate! 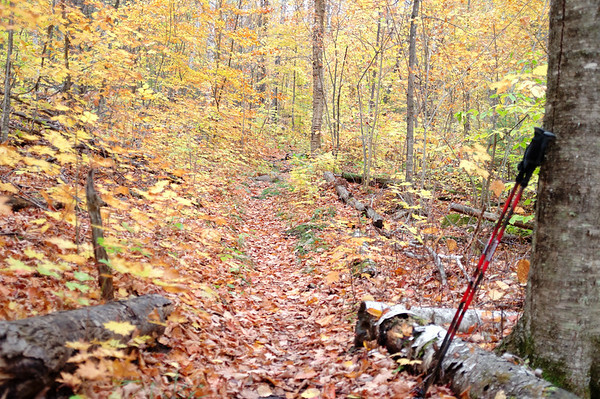 Compared with other trails, this was a pretty quiet place. As I descended, I encountered groups of other folk who were packing a lot of gear. Owl Head is along the way towards Giant Mountain and I imagine they were heading towards the lean-to that led towards the Giant Mountain Summit. Part of me wished that I had an opportunity to do a longer hike like that. Also happened to take a photosphere with my phone. Take a look at what it looks like up on the lookout point!